The output of 3.1A in total is shared between two usb ports ,The built-in smart chip can be 3.1AMP intelligent, fast, assigned to the two usb ports.There are also Receptacle Rating: 15A 125VAC, 60Hz output. Tamper-Resistant: the security mechanism within the outlet for when a single tool inserted, play a role in helping to lock. Unless a double plug is inserted at the same time. this feature can prevent unnecessary insertion, for people in the use of improved security. 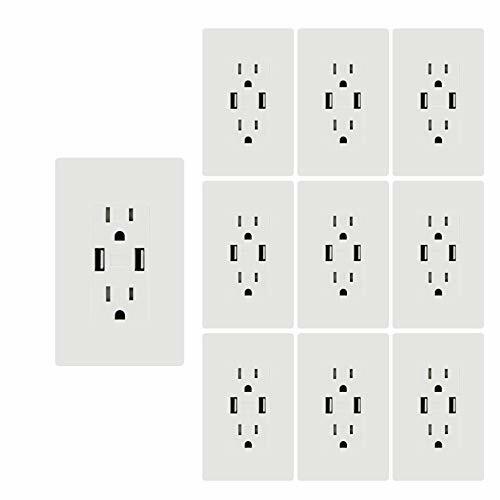 Output automatic protection: When the output is greater than 3.1AMP, the outlet will automatically stop working. Unplug it first, and then reinsert it again to allow the outlet to resume operation. Automatic Temperature Protection: less than 130 °F.When the temperature is greater than 130 °F, the outlet will automatically stop working until the internal temperature of the outlet returns to below 130 °F, will automatically resume operation.